Occult Rock’s recent resurgence can be traced back to one significant band and one extraordinary album; Sweden’s Ghost (or Ghost B.C as they are known in the U.S.) and their macabre debut, Opus Eponymous. Ghost may be instantly recognisable by their eccentric on-stage presence (hooded ‘Nameless Ghouls’ comprise the backing band while vocals are handled by the contorted and demonic, Pope-lookalike ‘Papa Emeritus’) but this only scratches the surface of what this extraordinary band, and their twisted odes to satanic rituals, have to offer. On Opus Eponymous, Ghost conjure a warm, consciously-traditional, 70’s Hard Rock sound, incorporating morose melody, haunting hooks and choruses so catchy you’ll require immunisation after one listen. As a summation, Ghost fashioned a modern record which appeared ‘new’ and yet was defiantly old-school in execution and analogue antiquity. Frankly, Ghost could have released this debut in 1970 and no one would have batted a slowly decaying eyelid. 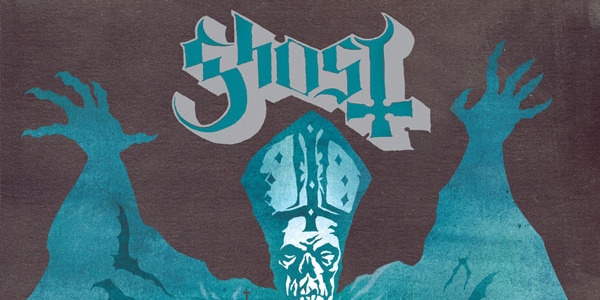 It is no coincidence that since 2010, Ghost’s popularity and Opus Eponymous’ impact has led to the exposure of the original Occult Rock band Coven (check out Witchcraft Destroys Minds & Reaps Souls from 1969 and prepare to be blown away) and for that reason alone our hell-bound souls remain humbly and eternally grateful.